I've had this shadow for quite a little while now and I must say it is a beauty. Our divine collection of high-tech creamy powder eye color will turn your eyes into opulent works of art. Why "Deluxe"? Definitely incomparable, the creamy formula feels like cashmere, blends beautifully, and delivers an even more intense burst of color than regular Urban Decay Eyeshadows. And, Deluxe hues have an even greater fill weight than our regular Eyeshadows - a generous serving. I love these shadows. They're super soft and apply really easily with a lot of pigmentation. Definitely not for the faint hearted or if you're just looking for a sheer wash of colour. I also love how all of these sport a different graphic on the front of the packaging. Makes it easier to find what you want. It even has a good sized mirror on the inside. 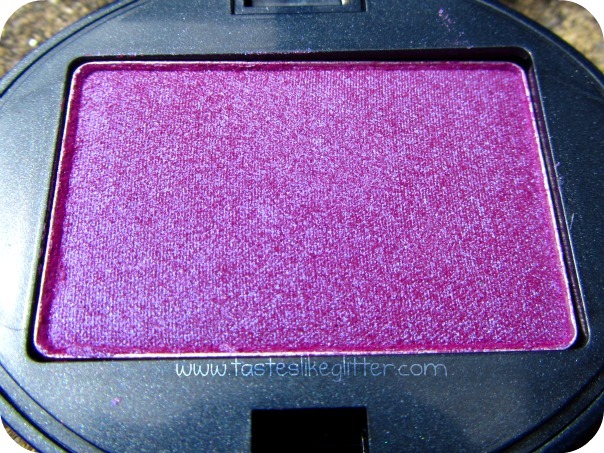 Fishnet is an iridescent pink based purple. With a pink shimmery duochrome to it. I'm a big fan of duos! You can see this in action in an EOTD here. I teamed it with lots of blue based purples so it really stood out against those. I'm a big fan of UD shadows and these are no exception. Buttery soft with a full on colour spectrum. The compacts are cute but can be quite bulky if you're carrying a fair few around. What do you think of the Deluxe shadows? Or Urban Decay shadows in general?